With reports of store closures dominating the retail headlines in 2017, opening a brick-and-mortar location may seem like a bit of a risky proposition. But YETI, the leading premium cooler and drinkware brand, bucked the trend and opened its first store in Austin, Texas earlier this month. The store is a one-of-a-kind retail environment that enables YETI to bring the many facets and dimensions of its brand to life. YETI has a loyal fan base, comprised of outdoor enthusiasts, hunters, anglers, pit masters and ranchers, plus your everyday consumer. To appeal to these brand enthusiasts, YETI partnered with Mood Media to create an unforgettable in-store experience. 1. 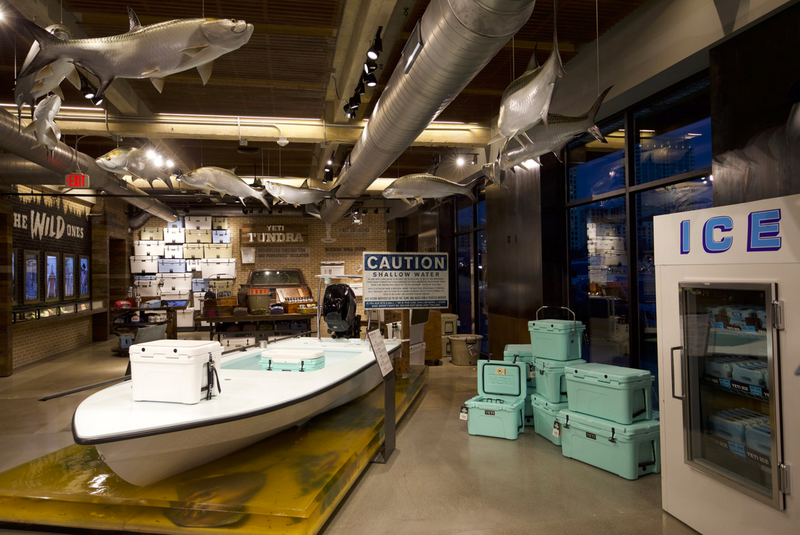 Scent: To bring the elements of the outdoors into the store, YETI implemented Mood Media’s ScentAir System. Consumers are surrounded by the scent of a campfire while shopping. 2. Music: While roaming, shoppers can find a stage supported by YETI coolers that highlights music, videos and live shows. And when there’s no live music, a Bose music system plays throughout the store. 3. Display: Digital signage is a big part of YETI’s in-store experience. YETI partnered with Mood Media to install Samsung visual displays throughout the store. For example, there’s a display built into the side of an old caravan door, showing YETI coolers withstanding extreme situations like explosions and bear attacks. There’s also a content zone that adds to the in-store experience. Shoppers can see visually dynamic, personal stories of YETI adventurers doing activities like skiing and surfing. 4. Creating Community: YETI’s loyal following has created a digital community. To bring that to life in the brick-and-mortar store, YETI installed a bar that serves up drinks with DIRECTV playing on television. The bar is a way for YETI fans to come together and relax and bond over a drink and a game. Shoppers can also check out one of pitmaster Aaron Franklin’s original smokers, and get educated on the art of smoking meats. Today’s consumers are expecting more from retailers, therefore, brick-and-mortar stores need to transform into something more than just another place to shop.